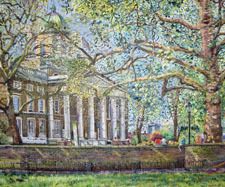 Growing up among the tall red brick mansion blocks of Kensington, Melissa Scott-Miller was an enthusiast for London's streetscapes from an early age. 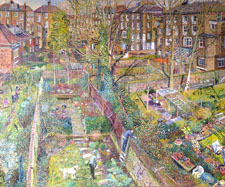 She has made the urban landscape her specialty, choosing metre-square canvases to record the rich detail of the city. 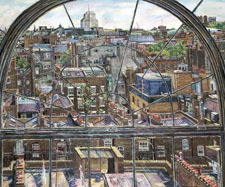 Where many painters would edit a view, eliminating the unsightly, Melissa details meticulously the frenzied jumble of church spires, office blocks, roof gardens, fire escapes, cranes and treetops that make up London's skyline. 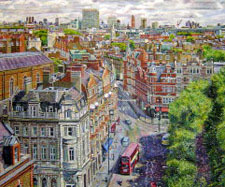 Melissa Scott-Miller is also a proclaimed portrait painter and a member of the Royal Society of Portrait Painters. 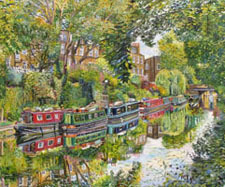 She specialises in portraits with interesting backgrounds and works from life rather than photographs. 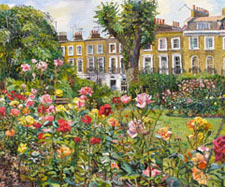 In 2019, Melissa will be exhibiting with a new artists collaboration ‘Urban Contemporaries at the Espacio Gallery, in Bethnal Green Road 5-10 March, and in September with the Twenty Twenty Gallery in Ludlow, along with the usual group exhibitions at the Mall Galleries, the Royal Society of Portrait Painters in May, the New English in June and the RBA in July.